Articles about parking lot, factory floor and field striping. As a part of painting these items it is normally a good idea to apply a band of reflective tape around the circumference so that vehicles can see and avoid them. 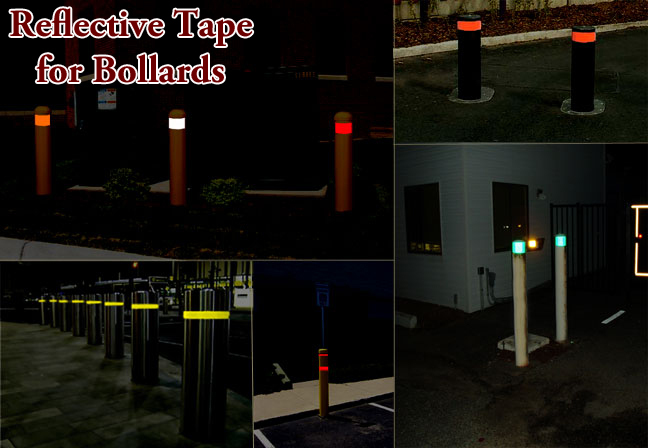 Because bollards are fairly large in diameter, any reflective tape will wrap around them. The choice would be how bright of a tape you need and how much you want to spend. Standard flexible engineer grade tape is inexpensive and easy to apply. It is very pliable and will conform very well. A 1 inch – 6 inch roll is normally plenty wide. Type 1 engineer grade is good for applications where the viewer is within 300 feet of the bollard. Prismatic reflective tapes such as an Oralite V82 or V92 will also work well and are much brighter. They are thin and will wrap well around a radius. You would use a brighter tape like one of these for applications where the viewer needs to see the tape a thousand feet out versus a few hundred feet. For applications that require a lot of conformability, a flexible high intensity tape is best. These tapes are in between an engineer grade and a prismatic tape in brightness. Good out to say 500 feet. Once you have your machine assembled and ready to use you are going to need some paint. For striping parking lots, warehouses or roads we recommend using traffic paint. There are several types of traffic paint. We recommend either waterborne acrylic or solvent/oil based traffic paint. Both have their advantages and disadvantages. Water based paints clean up very easily with water. They are easy to find and easy to thin and mix. Under normal conditions they dry very quickly. Normally in around 10 – 15 minutes. At night or on a cloudy day the dry time will increase. They are recommended over solvent based paints when spraying over sealcoat or fresh asphalt as the chemicals generally will not bleed through the paint. The only disadvantage is the dry time. It can be a little long at night or in moist conditions. Adding alcohol to the paint will shorten this time. Oil or Solvent based traffic paint generally dries very quickly. It must be thinned either with a solvent or mineral spirits. The machine would also need to be cleaned with a solvent or mineral spirits. Getting rid of the solvent or mineral spirits after cleaning may present a problem. Unlike water, it is unlawful to just pour it onto the ground. Also, since solvent or oil based paints dry so quickly you have to constantly clean the machines spray tip so the paint does not dry on it. These types of paint are not recommended to be used on sealcoat or fresh asphalt as bleed through often occurs. In other words your white or yellow lines can turn brown. Overall I highly recommend waterborne or water based acrylic traffic paint. You can find traffic paint at Sherwin Williams or a Home Improvement store. However, you will pay a premium price. To get a good deal on paint go to an independent paint store and look for traffic paint. When you find it look on the bucket for the manufacturer. They are normally fairly close and will almost always sell to you directly or point you to a distributor. You can save from $5 to $10 dollars per gallon getting paint this way. Lines on facto ry floors serve several purposes. Lines let people and machinery know where to go and where not to go. They designate where inventory and raw materials belong. They guide you to safety in the event of an emergency. And most of all, lines keep people safe. The liability to a company in the event of an accident on an unmarked floor is tremendous and avoidable. This article covers the various ways of striping a factory floor along with the pros and cons of each. We also cover what the different colors mean. The color of a line has a distinct meaning. The chart below outlines what the different colors mean. Solid color lines can be created using either paint, preformed thermoplastic or adhesive tapes. Striped lines can be created with paint or thermo but they are more easily created using pre-striped adhesive tapes. Remember, nothing sticks to wax, grease or dirt and nothing will stick to a wet floor. A clean dry surface that has been stripped of all wax and grease is necessary for any striping to work. If you prefer to use tape we carry a product called Tuff Mark. It is an industrial floor striping tape that is extremely tough and has a very aggressive adhesive. The tape comes in 2″, 3″ and 4″ widths. The rolls are 54 feet long each. We have red, yellow, black, white, green, blue, yellow/black and white/red. We carry the yellow and yellow/black rolls in 2 and 3 inches at safety-tapes.com. For other colors and widths you can contact us at 850-934-3157. The advantage of using tape is ease of application. (no equipment needed) Longevity is another advantage especially when using the Tuff Mark product. Adhesive tapes work well on slick, smooth surfaces where paint often has a problem sticking. The main disadvantage of tape is the cost per linear foot. You can click here for an image of the available colors. 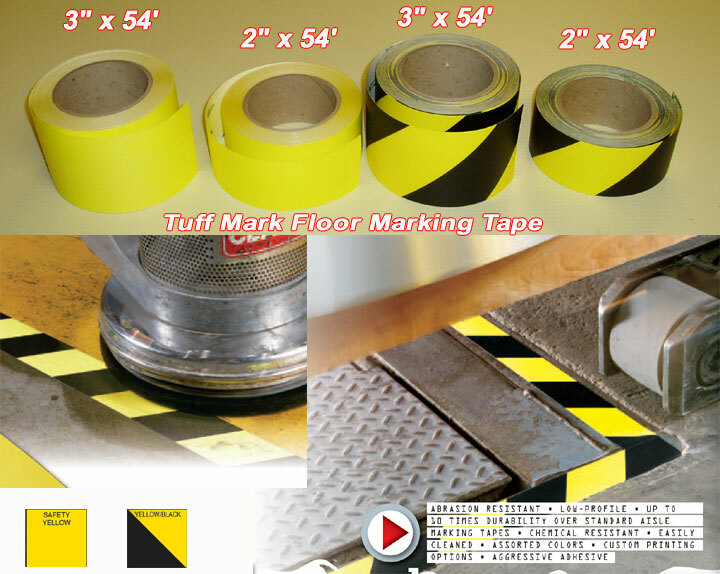 Another tape that you can use is our aluminum based floor marking tape. It is less expensive per linear foot than the Tuff Mark product. It has the advantage of being conformable since it is aluminum and is also removable if necessary. It can be damaged by fork lifts but is easily replaceable. We carry 1″, 2″ and 4″ rolls of this product in yellow and white. This product also works best on smooth surfaces but will conform if necessary. Painting floors is probably the most popular way to apply lines. A paint striping machine like the ones we sell on this site work very well. A striping machine can lay down a hundred feet of lines in just a matter of minutes. The disadvantage of paint is that on a surface that is very slick it tends to want to flake back off. This is because it was not able to truly grip the surface. Grinding or scarifying the floor can correct this issue. A striping machine will apply any color that you need. The only thing it won’t do is put down striped lines. Preformed Thermoplastic is another way to stripe floors. This is a 90 mil thick product that is melted into a surface. It is very tough and will last longer than any other form of striping. In general, this product will only work on a surface that is porous. To test your surface just take a teaspoon of water and apply it to the cement. If it soaks in immediately then preformed thermoplastic should work well. If it sits on top then preformed will not work well. As a general rule, if a surface is like a driveway it will be porous and will be compatible. If it is like a garage floor it will be too slick. One thing to note is that scarifying of grinding the surface can will make it compatible in most cases. Also, preformed thermoplastic works very well on all asphalt surfaces. Note – Tapes are great on smooth surfaces where all of the tape can make contact with all of the surface. Paints and thermoplastic work best on porous rougher surfaces where they have something to grab onto. Tape will often work on surfaces that paint will not stick to and paint or thermoplastic will often work on surfaces that tape will not conform and stick to. All of the products listed above have characteristics that make them the best choice given certain conditions. A typical factory may use tape, paint, and preformed thermoplastic for the different areas in the plant. OSHA and other regulatory agencies require that floors be marked for safety purposes. Striping or marking cement floors is always a challenge. When using paint or thermoplastic there are a few issues that make the task problematic. These are slick cement, curing compounds, grease and dirt. The good news is that these issues can be corrected. If you choose to paint your floors or use a melt down thermoplastic then the first thing you would want to do is a water test. Water Test – To see if your concrete is ready for paint or thermoplastic you can try this simple test. Take a tablespoon of water and put in on the floor. If it soaks in in just a few second then your floor is porous enough to accept a coating. If it sits there for several minutes then paint or thermoplastic will not perform well since it cannot grab the surface or soak in. Keep in mind that if water can’t soak in then the paint will not either. If your cement does not soak up water you do have the option of using an adhesive tape. We carry a product called Tuff Mark that is made to work on slick surfaces as long as they are clean and dry. It is very rugged and adheres very well. If you choose paint then the steps below will help. 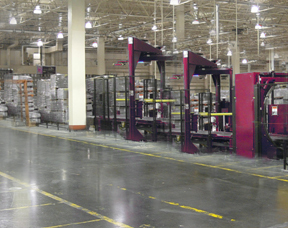 We have an article outlining the various ways to stripe factory cement floors at this link. Parking Lot Striping has been consistently rated as one of the top small businesses in America. Your initial investment is relatively low and profit margins are high. Once you have purchased your equipment and supplies, you will find that materials make up about 10% of each job. This means that the vast majority of the revenue from a job goes to you. A typical striping company can earn $2,000 – $4,000 profit per month with ease. To begin striping as a business you simply need to take the following basic steps. Set up a bookkeeping system and checking account. Purchase a striping machine and practice using it. Begin marketing your new business. Prepare quotes for new jobs. Complete the job and invoice the customer. This may seem like an over simplification of the process but it is really not very difficult. We started our company and before we even had a machine we had two jobs to do. One was Baptist Hospital and the other was Home Depot. We made about $3,000 in a weekend and paid for all of our equipment.